Rain Poppy is the first herb you will encounter in Pandaria. 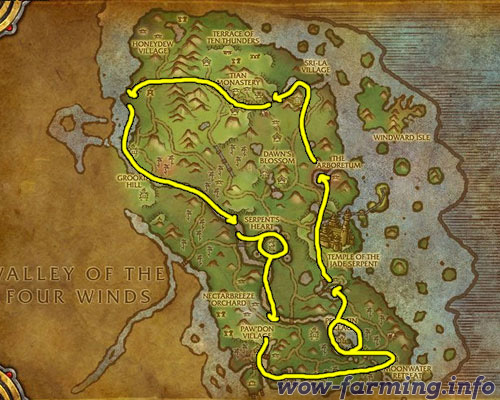 It’s found exclusively in the Pandaria starting zone Jade Forest. It’s still valuable because it is actually one of the easier herbs to farm and it sells in high volume to scribes who want to mill herbs for pigments. Rain Poppy sells best in stacks of 20 and should sell for 20-40 gold per stack. Since it’s one of the cheapest herbs, you can usually post 10-20 stacks at a time at high prices and expect them to sell in a few days. Update: You can make a lot of gold with Rain Poppy, but if you want to step it up and make thousands of gold you should read my personal favorite guide. Rain Poppy is only found in Jade Forest, so this is our only choice for farming. It spawns near large water sources, especially the inland pools in the center and southern parts of the zone. It’s not found along the coast, but instead only by inland lakes and rivers.